This is a continuation of my last post on growing basil. Like fresh basil, fresh parsley is indispensable to me. Unlike basil, good-quality parsley is available year round, but I still like to have lots of it in my garden throughout the growing season. We use it as a garnish, as a flavoring, and even as a salad green. Along with mint (which I also grow), it’s the most important herb in Middle Eastern cooking, and we do a lot of that. Parsley is a biennial, meaning that each plant lives for two growing seasons. The first year it produces leaves and a taproot that looks like a parsnip or white carrot (which are both closely related). The second year, it grows new leaves from the taproot and then flowers and goes to seed. During that first year, the plant makes lots of tasty leaves. In the second year, the plant concentrates its energy on the flowers, so there are fewer leaves and they don’t taste as good. So although the plant is a biennial, for kitchen garden purposes, it’s best to treat it as an annual. As with basil, I buy a flat of plants in spring. Parsley, which is winter-hardy, is available in garden centers much earlier than basil. I buy the plants as soon as I can, plant them in my vegetable plot, and start harvesting right away. At the end of the season I pull up the plants, and then I start again with new plants the following spring. If you decide to grow parsley from seed, you would start the plants in winter, set them out in spring, and continue to do the same thing every year, discarding the second-year plants unless you wanted to save one or two to collect seed. I suspect that like most tap-rooted plants, parsley plants would not do well in permanently wet soil. Garden centers and seed companies offer both flat- and curly-leafed parsley. The flat-leaf or Italian parsley has the stronger taste and is preferred for most cooking uses (except authentic Jewish chicken soup, which demands curly parsley). Like basil and all other herbs, parsley needs full sun. Parsley is delectable to many critters, both large and small. Therefore it’s necessary to protect the plants by growing them in a fenced vegetable garden, on an enclosed sun porch, or in a planter placed fairly high up. If you plant them in the ground without protection, they’ll be gone the next morning. Surely basil is the most delicious of all culinary herbs, made more so by the fact that it must be used fresh, and, because it’s an annual, it’s not available year-round in most climates. So basil is something to long for and look forward to for a good part of the year. And surely pesto is the greatest invention that humankind has ever achieved. Tonight I made my first batch of pesto for the year. I was so excited, I forgot to take pictures. Anyway, here’s how you make pesto: Around the end of May, you buy a flat of basil plants and plant them in the ground. Good, rich soil helps. These plants will work hard all summer. When you see that they’re beginning to bloom (that was yesterday), you cut the plants off almost at ground level (leave a pair of leaves so the plants have some energy to grow back). I cut 10 plants. leaving 6 so I can have fresh basil all the time. I can find a lot of uses for fresh basil. Take the cut plants in the house, enjoying the heavenly aroma, and wash them well. Pluck off the leaves–only the perfect leaves, not yellow leaves or stems or flowers–and put them in a salad spinner. Wash them again, and spin to dry. Peel three cloves of garlic and chop them in the bowl of a large food processor, using the sharp blade. Then put in the basil leaves (which should fill the bowl). Add 1/3 cup of pine nuts, toasted if you like (but not hot), and some salt and pepper. You can also put in some grated Parmigiano Reggiano (the best stuff only, not domestic or pre-grated Parmesan), but it’s not necessary. Run the food processor to chop everything together, and when the pesto is almost fully combined, pour in 1/3 cup of olive oil in a thin stream with the motor running. Taste for seasoning, and freeze the pesto in little containers, each holding about 2 tablespoons, which is ample for a meal for two people. This recipe makes about 6 of those containers. When you serve pesto on pasta, defrost it and mix it in a big bowl with a little of the pasta water to thin it out. Then add the hot pasta and lots of grated cheese. The best part about growing basil is that in about a month, the plants will have regrown and I’ll be able to make another batch of pesto. There’s nothing like taking a container of green magic–the taste of summer–out of the freezer and eating pasta with pesto on a cold, dark winter day. If you’re among the many people who put in tomato plants over Memorial Day weekend, a few simple suggestions will help you achieve a delectable crop (Although the moment you begin to grow any food crop, you begin to realize how difficult it is, and you develop a great respect for farmers). So using proper cultural practices certainly will help, but it won’t ensure a great crop. If we get 22 inches of rain in August like we did a couple of years ago, your tomatoes will crack on the vine. 1. Tomatoes are subject to many, many pests and diseases, so start with plants that are resistant. For example, the letters “VFN” after the name of a tomato variety means that it’s resistant to verticillium wilt, fusarium wilt, and nematodes, three of the most common problems. Read the label carefully. However, “resistant” doesn’t mean immune. Your plants can still get diseases, so it’s always important to use proper cultural practices. 2. Plant in a place with full sun and soil rich in organic matter. This is the place to use your compost. It also makes sense to try to grow your tomatoes in a different part of your garden each year. 3. Give the plants plenty of room. When planting, most people underestimate the size of a mature tomato plant. It’s understandable–you look at those tiny seedlings and stick them in the ground, perhaps a foot apart. Then you carefully place a 4′ stake or 3′ high tomato cage and look forward to coming back in six weeks or so for tomatoes. Sorry. It doesn’t work that way. By August, that tiny seedling can easily be 8′ tall and full of side branches. Most likely, it will pull down that puny support and lie sprawling on the ground. Tomato plants are vines, not shrubs. They keep growing all season, and they keep putting out side branches, or suckers. The plant gets immensely crowded, the sun can’t reach most of the leaves, and air can’t circulate. Diseases take hold, and fruit production suffers. So space your plants at least 2′ apart–3′ is better–and use stakes that are at least 8′ high. 4. Tie and stake your tomato plants properly. As the plant grows, be vigilant about removing suckers (side branches), and keeping the new growth tied to the support. 5. Water and feed wisely. Tomato plants are fussy about how much water they need, especially when they’re producing fruit. A third post from last year summarizes the most important rules. Good luck. Notice there are no pictures in this post? That’s because I’m not growing tomatoes this year. The first seed catalog of the season arrived yesterday, and I sure am ready to plan this year’s vegetable garden (above you see least year’s in late May, full of nothing but promise). In fact, I already have planned for the coming season. Because I grow vegetables in a community garden that was overrun with pests and diseases last year, I’m going to avoid crops that need to stay in the ground for a long time and concentrate instead on quick harvests. That way, I can get the plants out of the ground before the pests take hold. 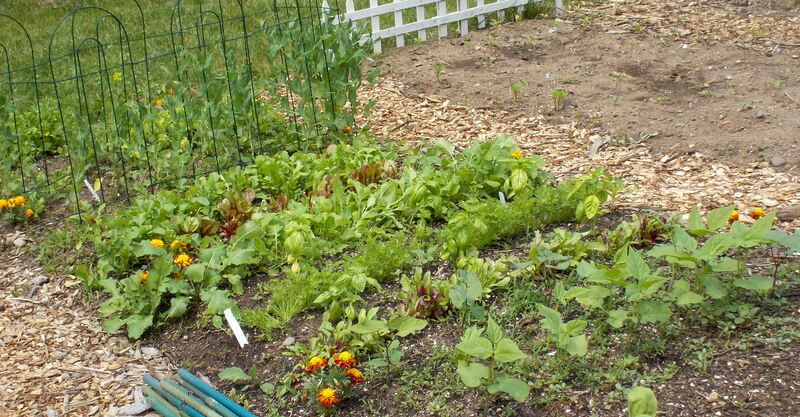 So I’ll grow lots of salad greens and bitter greens that pests tend to avoid, peas, one early crop of beans, and herbs like parsley and dill that the rabbits devour in my home garden (and I’ll have a nice crop of swallowtails as well). And lots of basil, of course. Beets and carrots should also do fine. But no squashes, cucumbers, or tomatoes, although I may try tomatoes in large pots at home, or devote a small patch of ground to them just off the patio. In the meantime, this is the season for pruning woody plants–from now until mid-February is the best time to do it. There’s no excuse for staying out of the garden in winter! Photograph the birds, screen compost, and prune. There’s lots to do! In rural areas where lots of people hunt, the common greeting in fall is “Get your deer yet?” “Getting your deer” means preparing for winter, laying in supplies. In the suburbs we don’t hunt (often I wish we did, because we have way too many deer and rabbits), but we still prepare for the coming year. One of the ways I do that is by gathering the leaves that fall on my lawn. I started “getting my leaves” today. I’ve written about the “Leave the Leaves” program that governments are instituting in many parts of the country–encouraging homeowners to recycle their own leaves rather than leaving them at the curb for recycling. I wish we had a program like that in this area, and I keep all my leaves. The ones that fall on the front lawn get chopped up by the mulching mower–they serve as lawn fertilizer, the only kind I ever use. The ones that fall on the back lawn go into the compost. 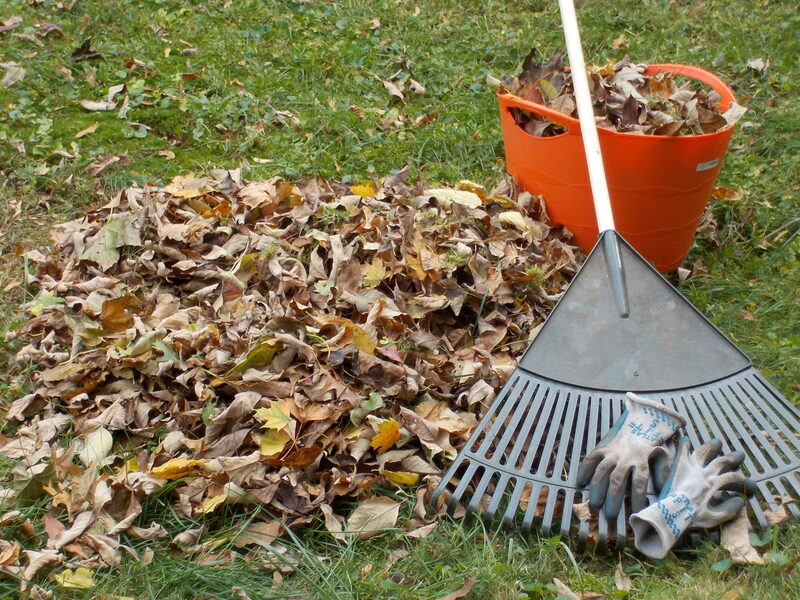 In the fall, I rake all the leaves from the back lawn onto a narrow strip on the side of my property, pile them up, and add them to my compost pile as I need them throughout the year. By late August, I will have used them all up to make two or three loads of compost, and I’ll have to go scavenge the first fallen leaves from a roadside strip a block away from my house. But that’s a long time from now. Right now, I’m enjoying autumn’s bounty. Those leaves will make compost, which in turn will allow me to grow vegetables next year without any chemical additives.